Treating fabrics with Terial Magic allows fabrics to hold shapes and not fray when cut, sewn or ironed. Think of a fabric with paper like qualities that you can cut, sew, iron gather and shape into art or whatever you want to do. It irons beautifully!! 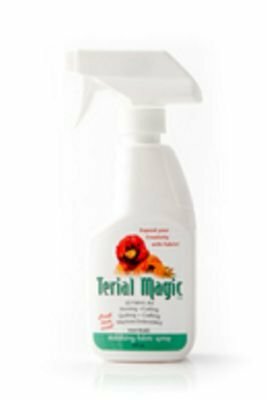 Terial Magic lasts, but is water soluble and can be washed out if desired.